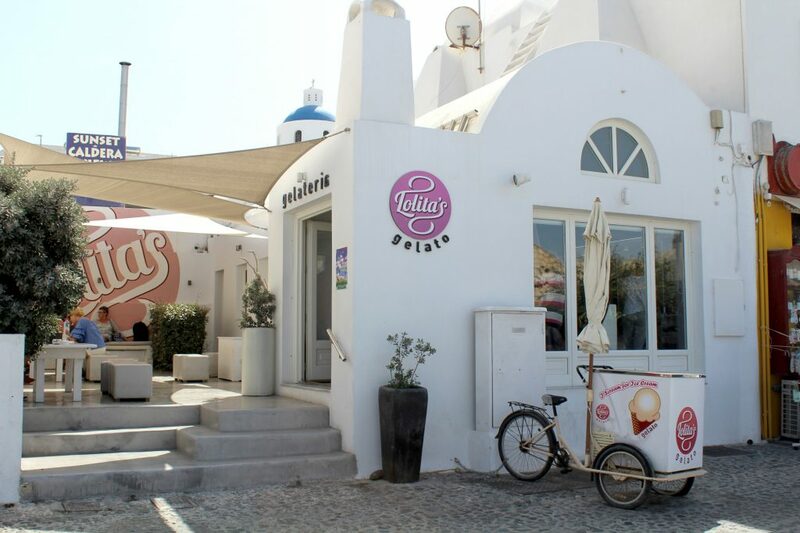 Theoni’s Kitchen is another one of those simple but honest places to eat in Greece. 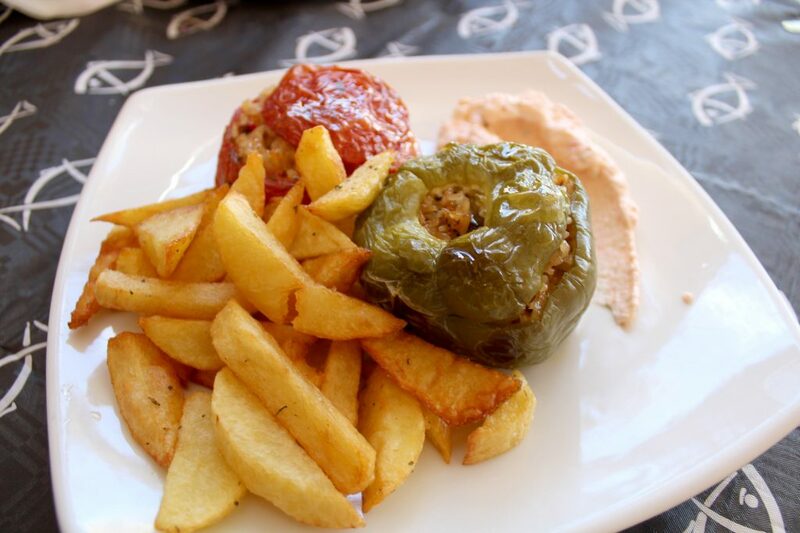 Traditional Greek food, served with simple ingredients, resulting in super flavorsome dishes and totally affordable! 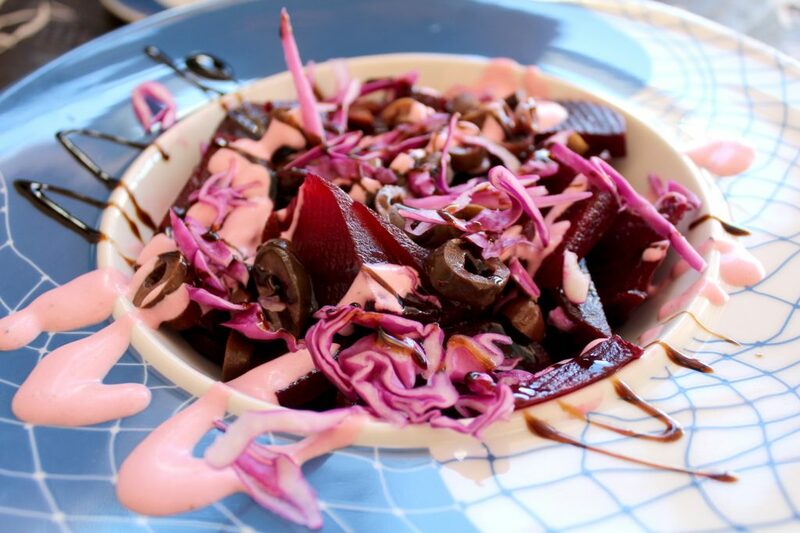 Fresh beetroots with yogurt and garlic dressing. 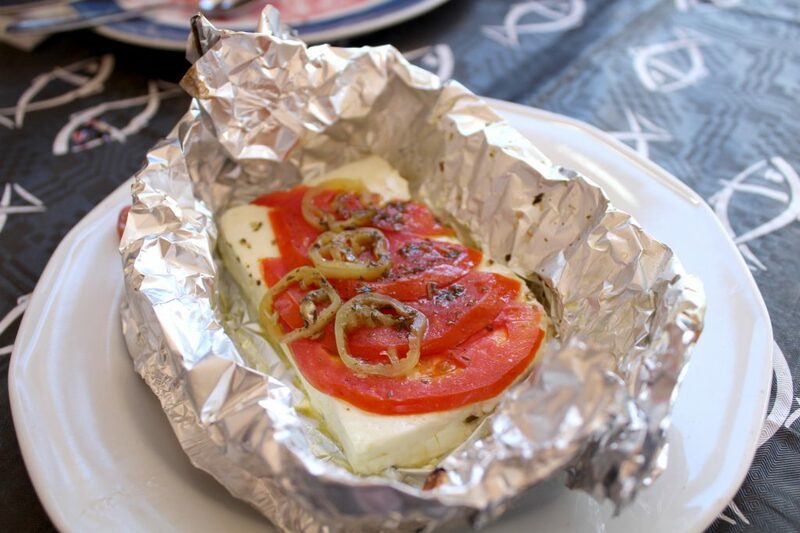 Grilled feta cheese with tomato, chilly, oregano, and olive oil. 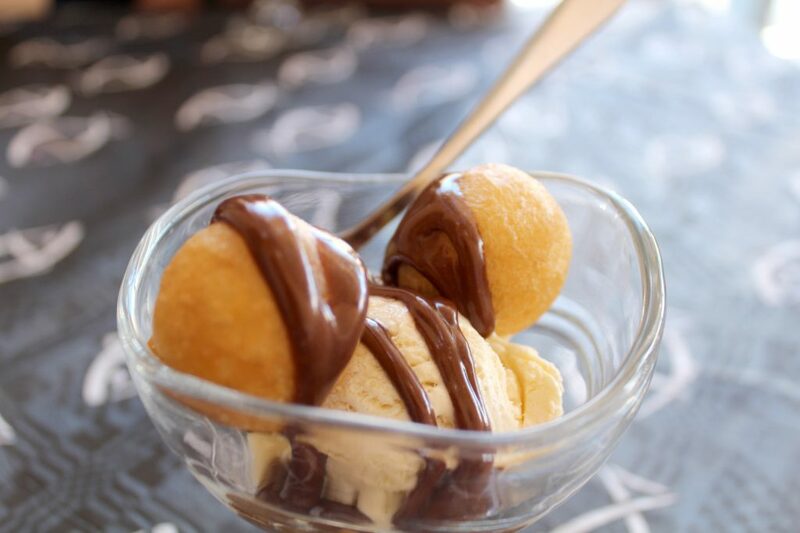 Lukumades with vanilla ice cream. 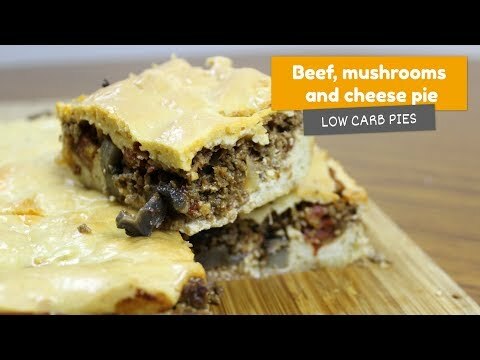 As I said at the beginning of this post, food was simple but delicious. 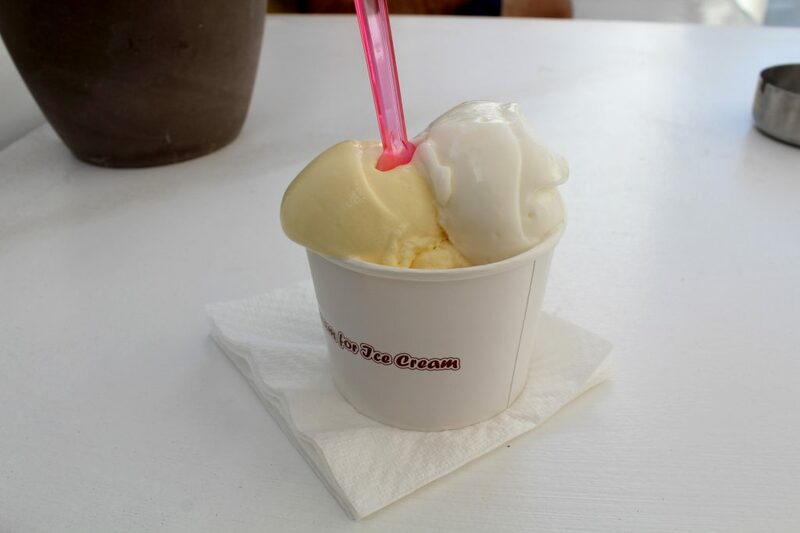 Kudos for the free Lukumades with ice cream served with our bill. 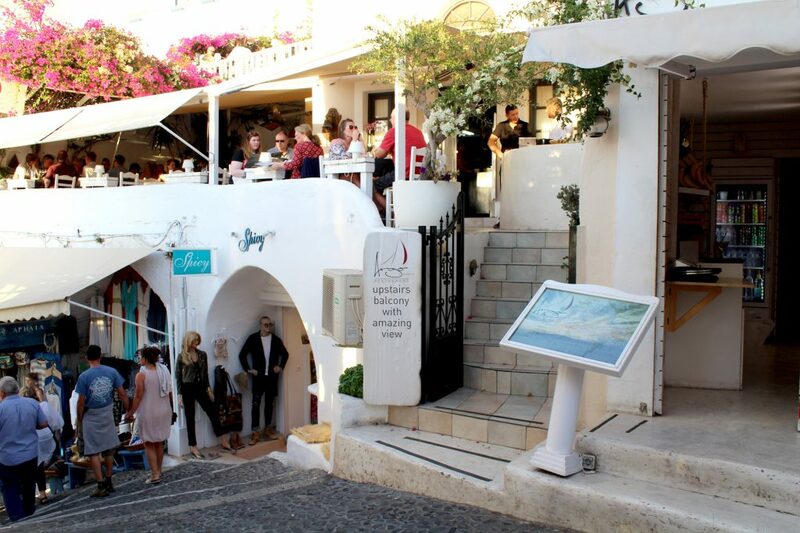 You need to be careful when dining in Santorini. There are plenty of places that sell you a great view of the famous sunset but not always followed by good food. Thankfully, this is not the case at Argos Restaurant, a really good spot to spend a few euros while having some wine, great food, and perfect atmosphere. 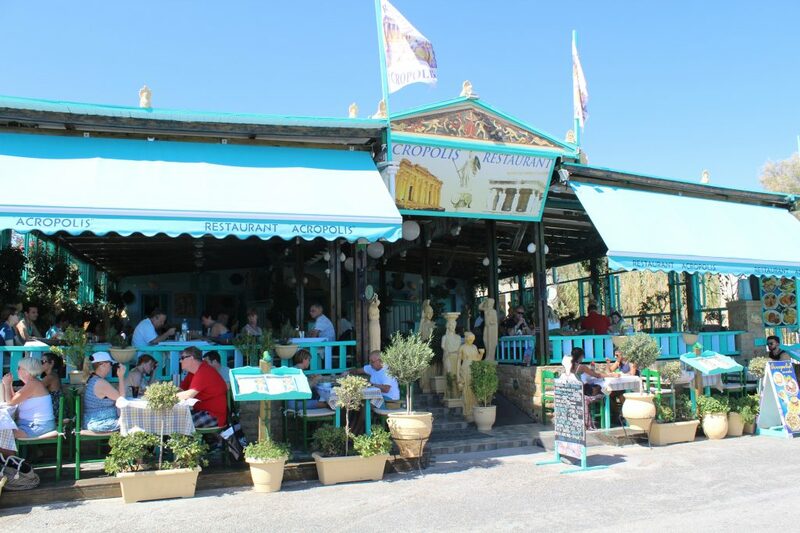 This place has also an amazing service and very good ocean views (book in advance as not all tables have a good view). 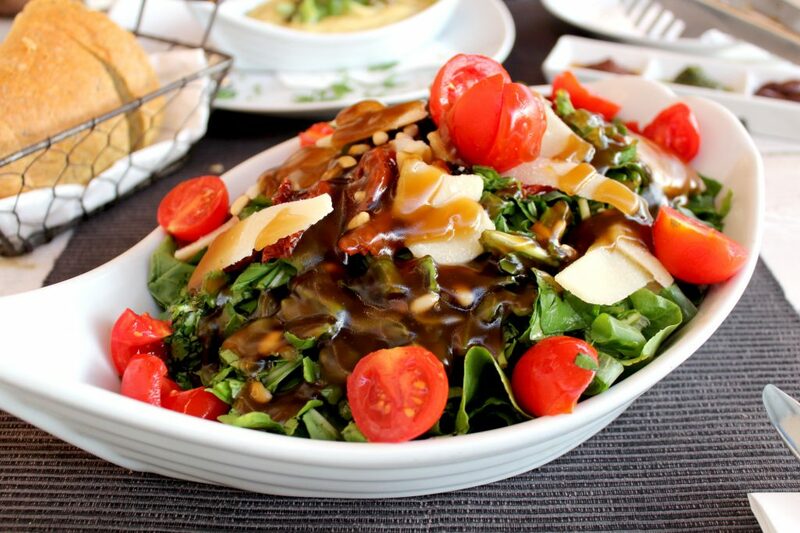 Santorini salad – lettuce, arugula, raisins, fresh onion, sun-dried tomatoes, pine seeds, parmegiano cheese, and special honey dressing. 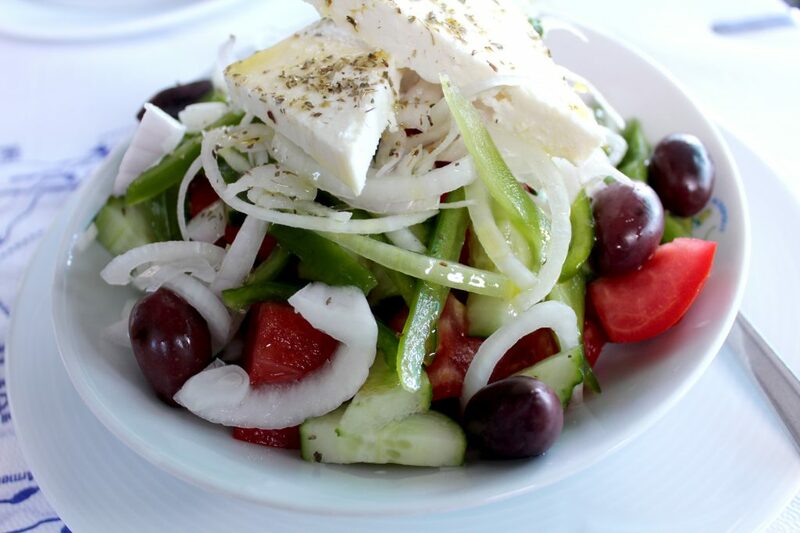 I loved all the salads I had in Greece, they totally nail the salad department in that country. 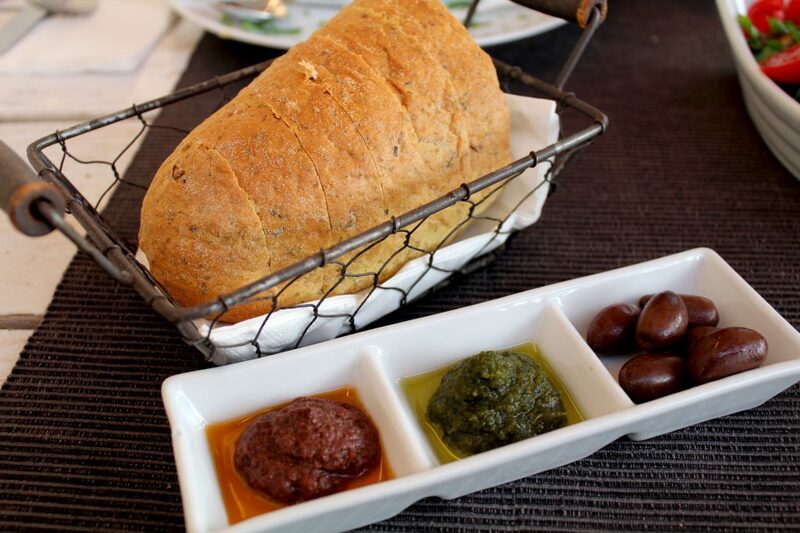 At Argos wasn’t different, perfect salad, followed by great homemade bread, dips and fava paste. What a meal! 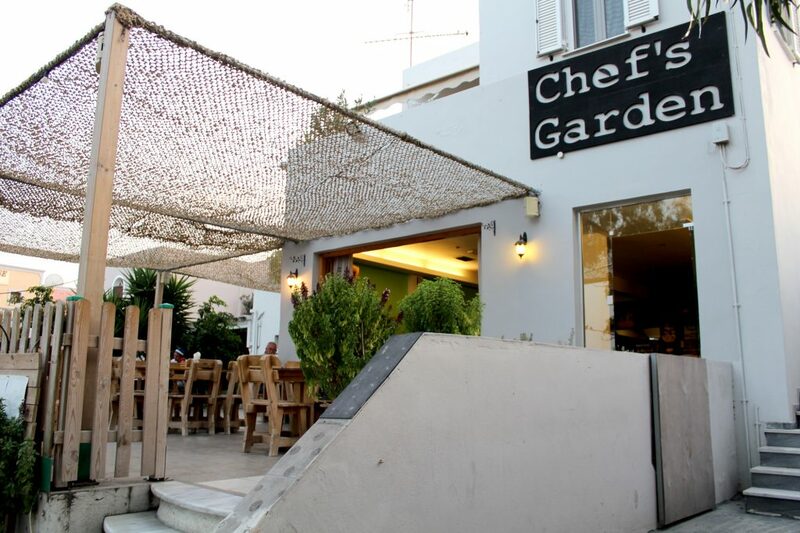 My belly makes happy noises every time I remember our dinner at Chef’s Garden. 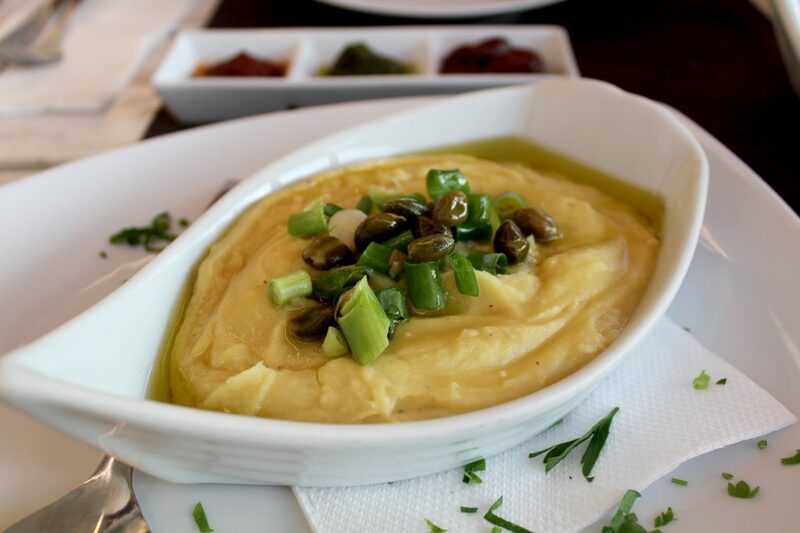 Their menu is full of great traditional Greek dishes and also some house creations, all extremely delicious and well served. I might say we got a bit excited with their menu and ordered more than we could handle. 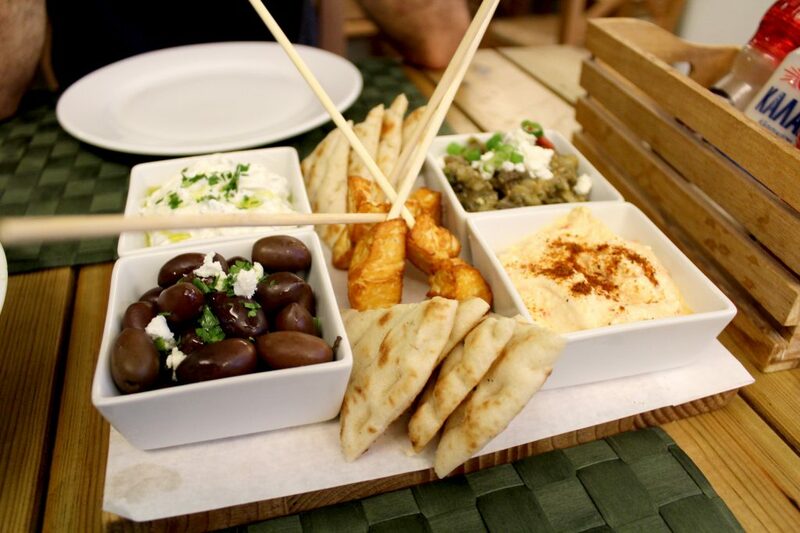 Chef’s mezze board – Tzatziki, roasted eggplant dip, chilly feta cheese dip, marinated olives and feta, halloumi skewers, and grilled pita bread. 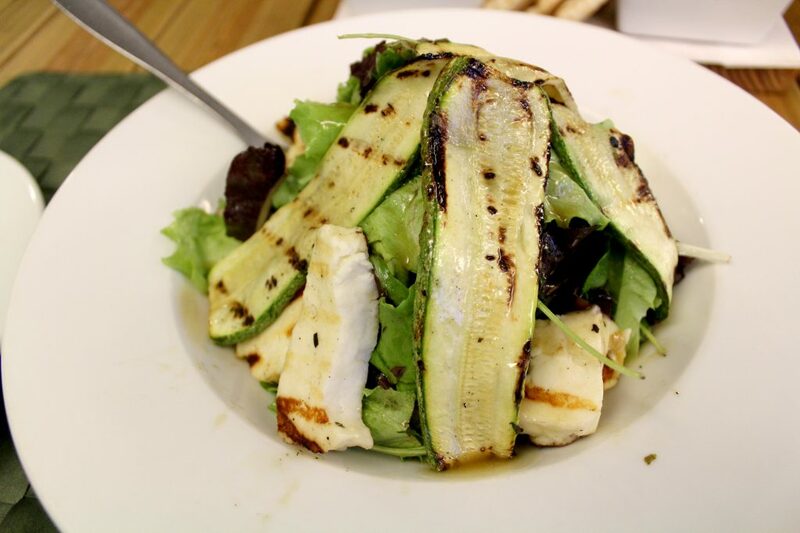 Halloumi salad – mixed baby leaf salad, lamps lettuce, grilled zucchini, and balsamic honey & mustard dressing. Mine: Lamb kofta in spicy tomato sauce, and Greek yogurt, served on pita bread. Hubby: Grilled halloumi cheese burger – with mixed baby leaf salad, hummus, roasted peppers, sweet chilly dressing, served with fries. 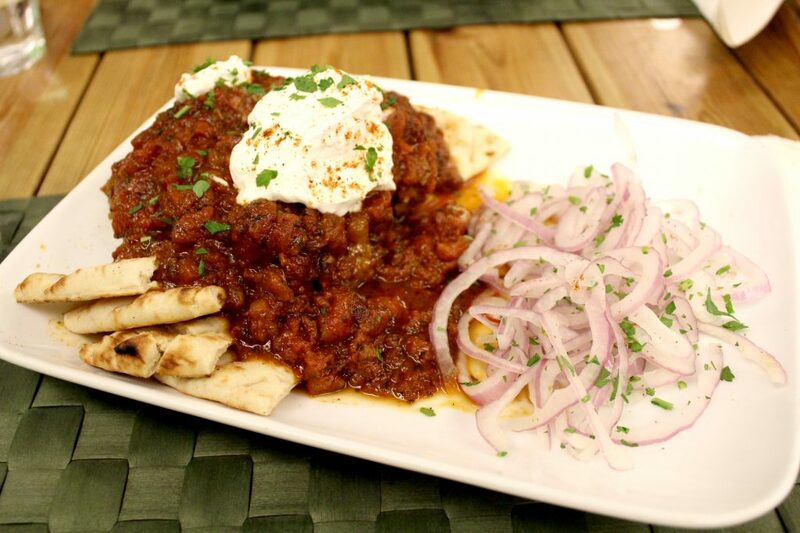 Lamb kofta in spicy tomato sauce, and Greek yogurt, served on pita bread. 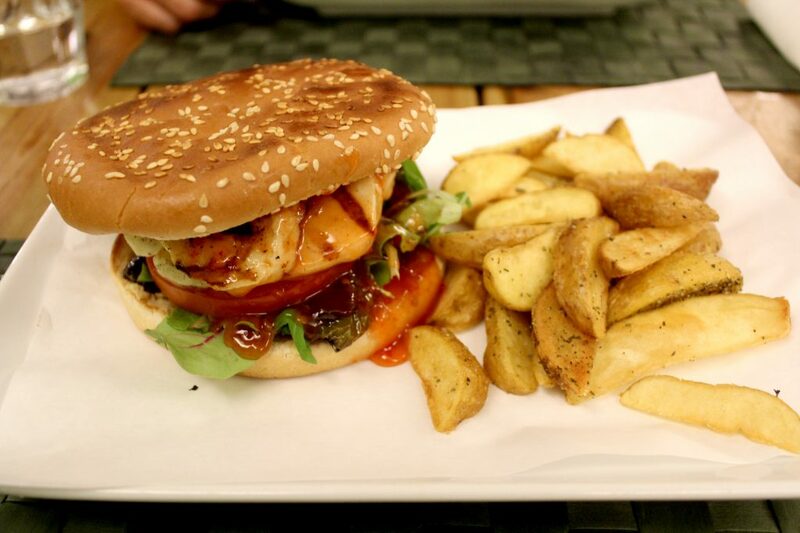 Grilled halloumi cheese burger – with mixed baby leaf salad, hummus, roasted peppers, sweet chilly dressing, served with fries. Their portions are HUGE and food delicious, a dangerous combination. It’s very easy to overeat at this place. I dream with that salad and entree till today, it had one of the best hummus I’ve ever had. I totally recommend the trip to this place! 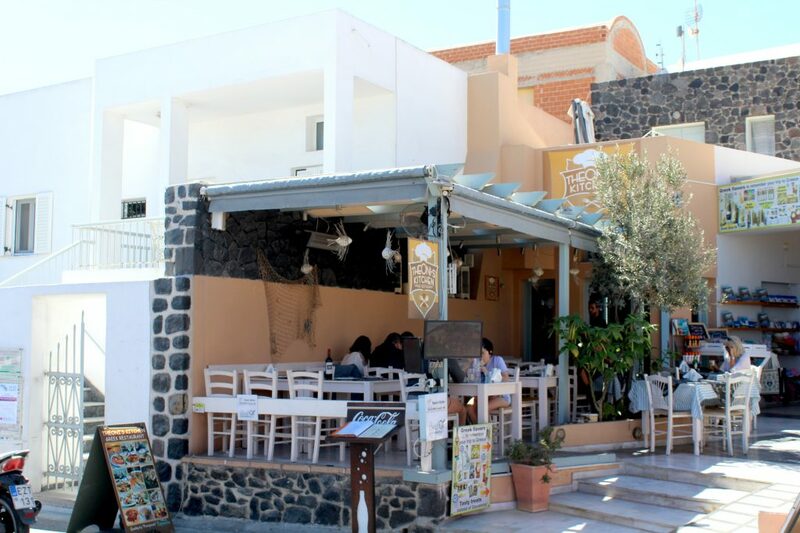 Looking for a place to have an honest meal while enjoying the beach? 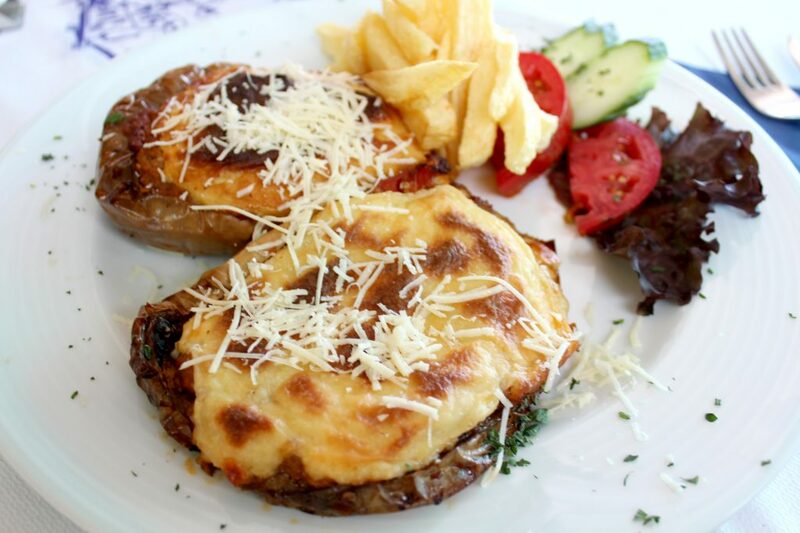 Acropolis Restaurant offers you both worlds. 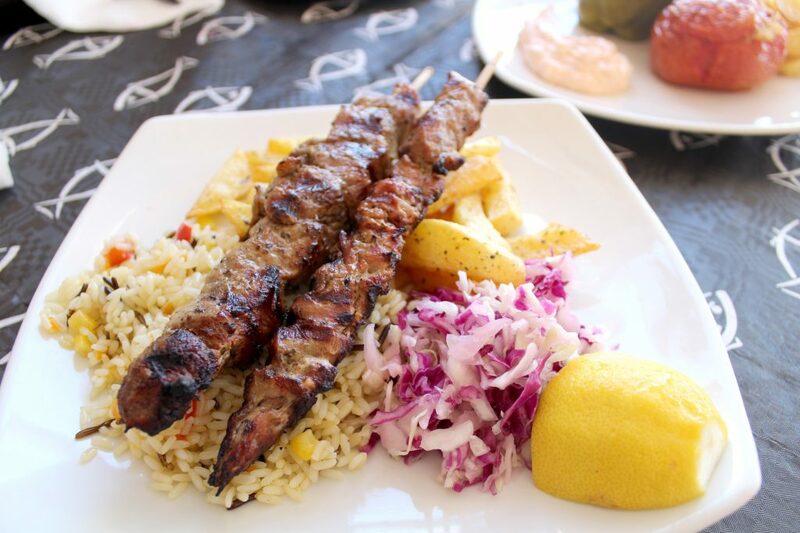 Right in front of Perissa beach, you can have some Traditional Greek dishes, with great beach views and affordable prices. As you could see, everything was very simple but super delicious. 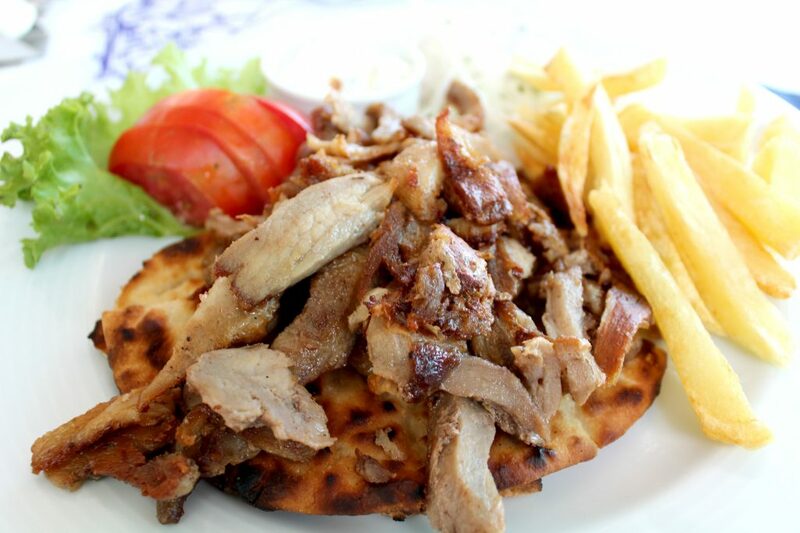 This is what I find incredible about Greek cuisine, things don’t need to be complicated to taste good, everything looks and tastes like a meal my grandmother would make for me, full of flavor and love.